The last Friday of each month I try to source a contribution from a guest writer. This month, David Carroll gives another slice of his early life growing up in Dunmore East concerning the shipwrecked Saint Austell. It’s a wonderfully researched account of a different age. I always enjoy reading his personal memories of the village and in this piece, a fascinating trip to the Hook via a crumbling New Ross bridge. The account of the Saint Austell, and particularly its skipper itself is quite bizarre. I’m sure you will love it. 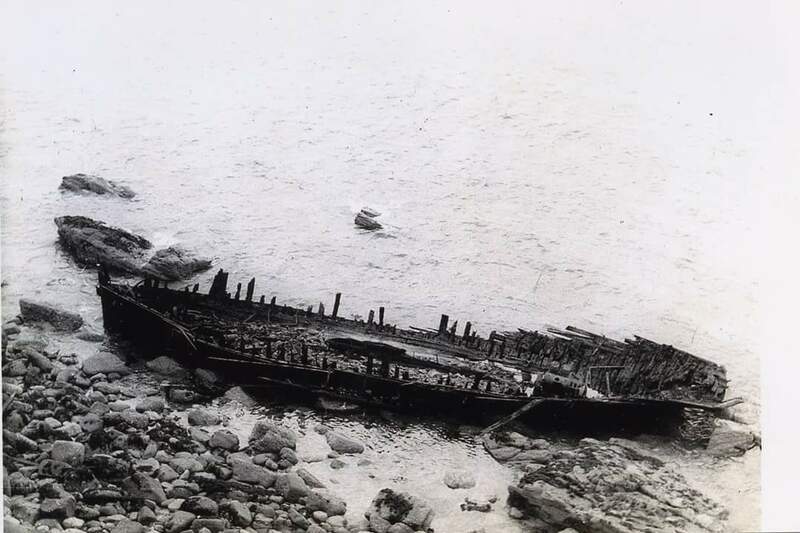 I was fascinated by this account as I could still recall seeing the shipwreck of a schooner about three miles from Hook Head, when I was about eight years old circa 1955. Was it the same ship? Not too many schooners remained to be shipwrecked, even in the 1950s. I contacted Andrew Doherty from Waterford Harbour Tide ‘n’ Tales, as I knew he would be an excellent source of information and he immediately sent me an extract from John Power’s ‘A Maritime History of County Wexford’ and I was now certain that this was the same vessel and with my appetite whetted for information, further investigation was required. Incidentally, that road trip to the Hook around 1955 was an eventful one. Living in Dunmore East, we were only about three miles from Hook Head across the entrance to Waterford Harbour but to reach it by land involved a journey of over fifty miles each way. We looked across each day to the Hook to see what fishing boats or yachts were out to sea heading towards Dunmore and ships heading up the harbour to the ports of Waterford or New Ross. At night, we would watch the Hook light flashing away keeping all shipping safe. The tower looked massive compared to our small lighthouse in Dunmore. My father had long promised to visit the Hook by car and eventually the big day arrived. I can remember our car well. It was a black Morris Minor and the registration number was WI 2656. There was no car-ferry at Passage at that time so a car had to travel to New Ross to cross the river Barrow and then drive down the other side of the estuary by Duncannon to reach the Hook. 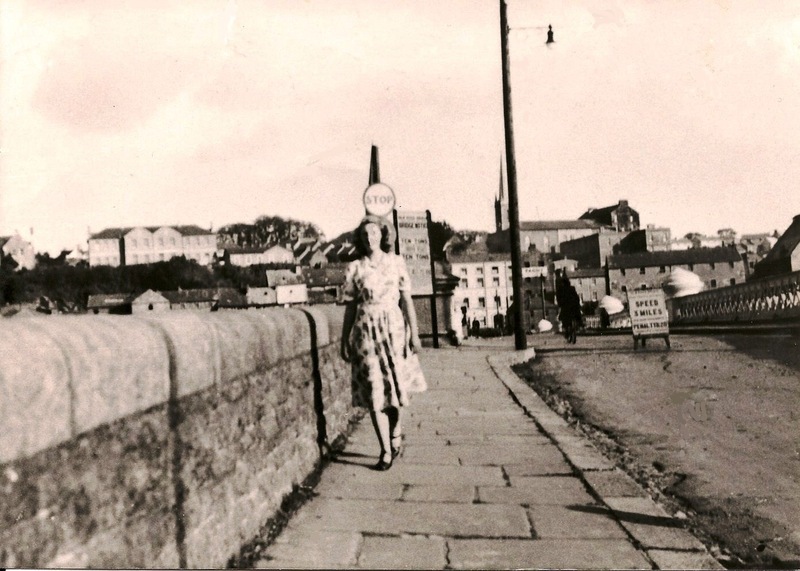 The bridge in those days at New Ross was not for the faint–hearted. Barrels were placed all along the bridge to slow cars down to a snail’s pace as they zigzagged across the very unsafe looking structure. By the time President Kennedy arrived in 1963, a new modern bridge had been erected. My father, from his navy days, knew William Hamilton, one of the keepers at the Hook and he brought us to the top of the tower and were able to look back across at Dunmore, which was a great thrill. On our way home, we stopped a few miles from Slade to look for a wreck of a schooner that my father wanted to see. I now know that this was Sandeel Bay. The wreck was a bit disappointing; it was just a ‘black blob’ on the rocks. I had a much more romantic vision of wrecked sailing ships, probably from reading books where the masts were still standing and the seas crashed in over the bow! I am afraid that what little remained of the poor Saint Austell was anything but romantic. A sad end for a sailing ship that had traded for almost 80 years. This is an image, that as a young boy, I thought all shipwrecked sailing ships looked like! The schooner Saint Austell was launched at Portreath in Cornwall in 1873. She one time carried coal between Wales and Devon but in later years from England to Ireland. 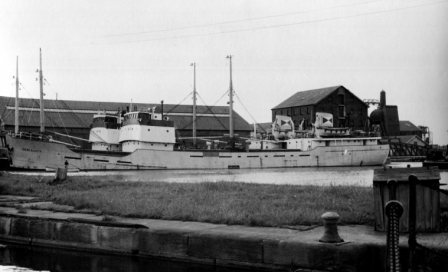 In early 1952, the Saint Austell was damaged when she hit the quay wall at Drogheda, where she had arrived with a cargo of coal from Garston. The owners decided to dispose of her. Some members of Drogheda Harbour Commissioners, as reported in the Drogheda Independent of April 12 1952, contradicted this account of events for fear of it having a negative effect on the reputation of the port! The purchaser was Mr. Kevin Lawler, a 29-year old marine engineer, originally from Athy, Co. Kildare but living at Kincora Road in Clontarf, Dublin. Lawler intended to make a single-handed crossing of the Atlantic to America in the schooner. He said that this was to answer a challenge made two years previously that he “had not got the courage to do it”. A number of friends accompanied Lawler as far as the Kish lightship and when other were saying farewell, Thomas McDonagh, described as a 40-year old labourer from Baldoyle, Co. Dublin hid as a stowaway in the hold. At 8p.m., McDonagh came on deck. At 1a.m. on Sunday the engine stopped. At 4pm. on Sunday, the Irish Lights vessel at Coningbeg saw the Saint Austell, apparently with broken-down engines, drifting inside the Coningbeg Rock. It remained in this dangerous area until midnight. Earlier in the day the Saint Austell, with the Tricolour fluttering from her masthead, had exchanged signals with a Dutch vessel. 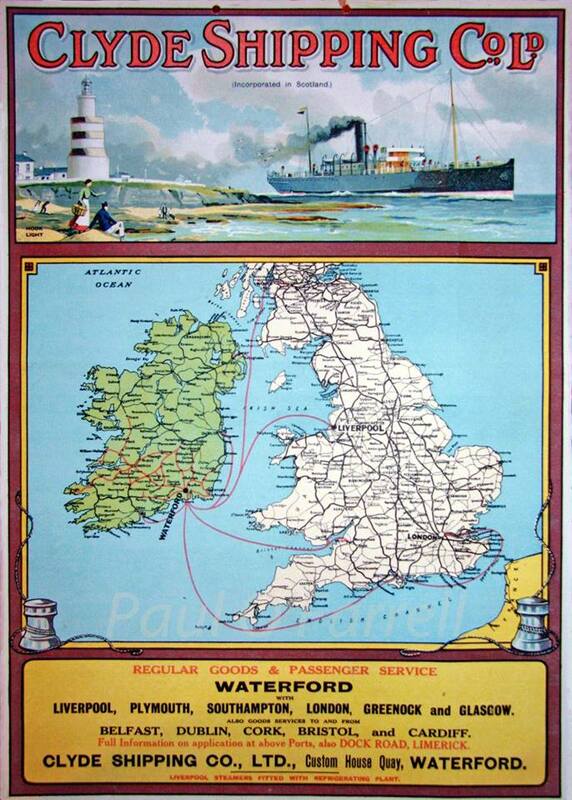 John Power’s A Maritime History of County Wexford states, “When off the Wexford Coast, she was observed from the lookout at Rosslare Harbour to be going around in circles for some time inside the dangerous Hantoon Bank off Wexford Harbour”. After the engine had stopped, Lawler worked on it all day and all night but without any success. He again tried on Monday morning but the engine went on fire. The flames spread rapidly. William Hamilton, principal keeper at Hook lighthouse was on duty and shortly after dawn saw a glare out to sea. He telephoned Dunmore East lifeboat station giving the location of the Saint Austell. Fearing that the lifeboat would not arrive in time, Mr. Hamilton later decided to get help from the nearby fishing village of Slade, where he roused Thomas Williams, Thomas Barry and Martin Fortune. The four men left at once for the blazing ship in Mr. Barry’s motor vessel Sunflower. When rescued, McDonagh was only semi-conscious. Lawler did not appear to be any worse for his experience. The men had been in the water for over an hour and had clung to a floating ladder. As they were being hauled aboard the Sunflower, the Dunmore East lifeboat drew alongside. There was a loud explosion on the Saint Austell as the boats drew away. There was no lifesaving equipment aboard the stricken vessel apart from a rubber dinghy, which could not be launched, having been burnt out. Some minutes after the rescue craft arrived on the scene, the foremast of the Saint Austell, which was carrying a large amount of diesel oil (1,000 gallons or 1,500 gallons – depending on which newspaper you read), collapsed. Lawler and McDonagh were brought to the home of Mrs. Richard Barry, Slade, the local representative of the Shipwrecked Mariners’ Association. Here, Dr. O’Dwyer of Duncannon attended them. Later, it was learned that the two men were removed to Wexford Hospital for observation. 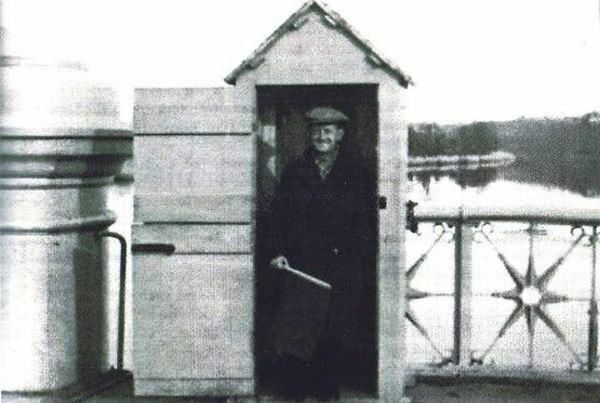 Mr. Arthur Wescott-Pitt, Honorary Secretary of the Dunmore East lifeboat gave an interview to an Evening Herald reporter and said “Lawler told me that it all happened in a flash”. The boat, which was still blazing several hours later was then located just off the coast about three miles east of the Hook Tower where it was driven ashore. Misfortune at sea seems to have followed Kevin Lawler. 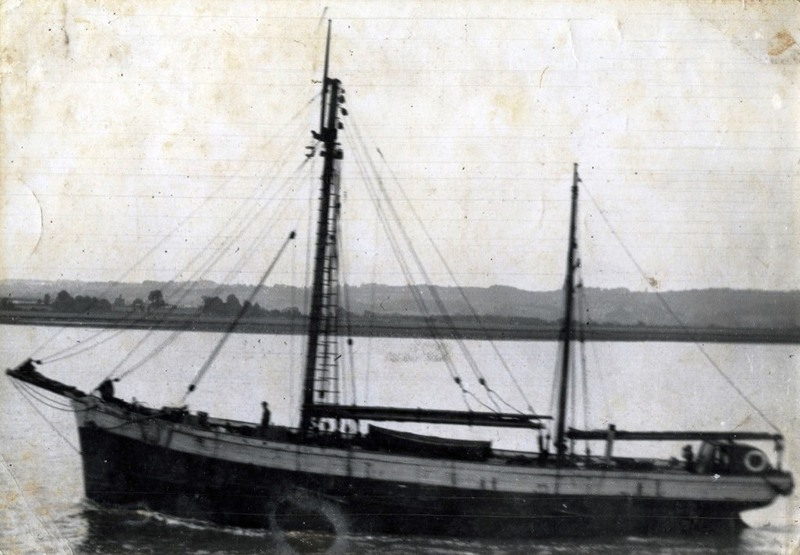 The Irish Press reported as a footnote to their account of the Saint Austell rescue that on August 1st of the previous year, Lawler and five companions were sailing towards the Welsh coast in the steam trawler Lady Fry when it sprang a leak off Holyhead and sank. They were rescued by another trawler. I endeavoured to research press cuttings in Irish newspapers about this incident but was unable to find any further information. A headline in the Irish Press on Wednesday April 16 1952, two days after the dramatic rescue said, “Shipwrecked voyager says I’ll try again – I’ll get another boat somehow” says 29-year-old Kevin Lawler, the Athy marine engineer whose attempt to sail the Atlantic in the motor ketch, Saint. 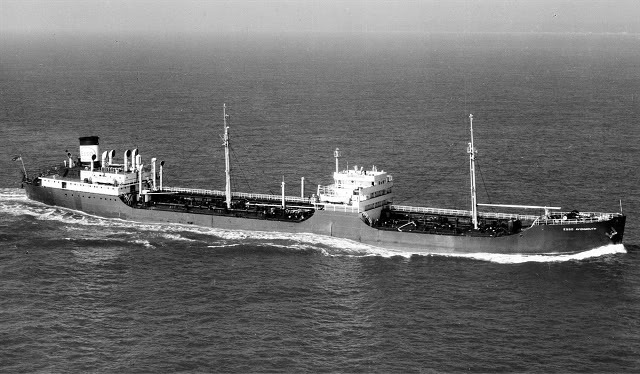 Austell, ended when the vessel caught fire off the Wexford coast. The report goes on to say, “The Saint. Austell was not insured and Lawler estimates that his loss is well over £2,000”. On May 26 1952, in ‘Along the Waterfront’ a marine miscellany in the Irish Press, writer Mac Lir reports that Kevin Lawler had a new steam trawler Mint. He signed Thomas McDonagh on as the cook. 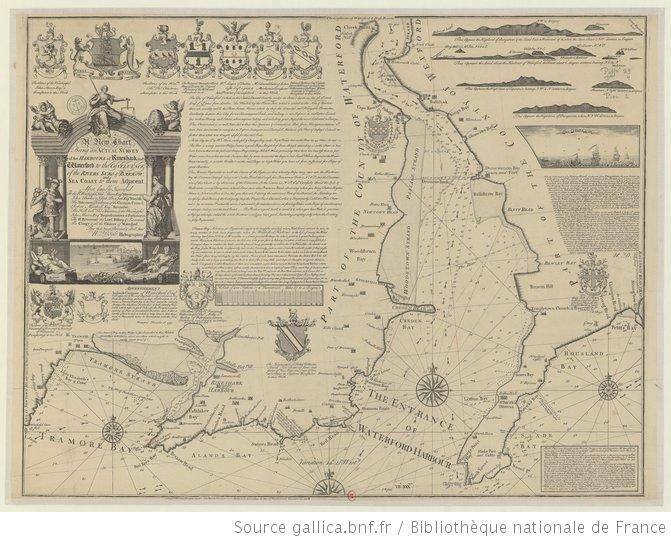 Whether Mint ever attempted to sail the Atlantic, I shall leave to others to research! Thank you David for another slice of a fascinating early life in Dunmore East and the harbour. 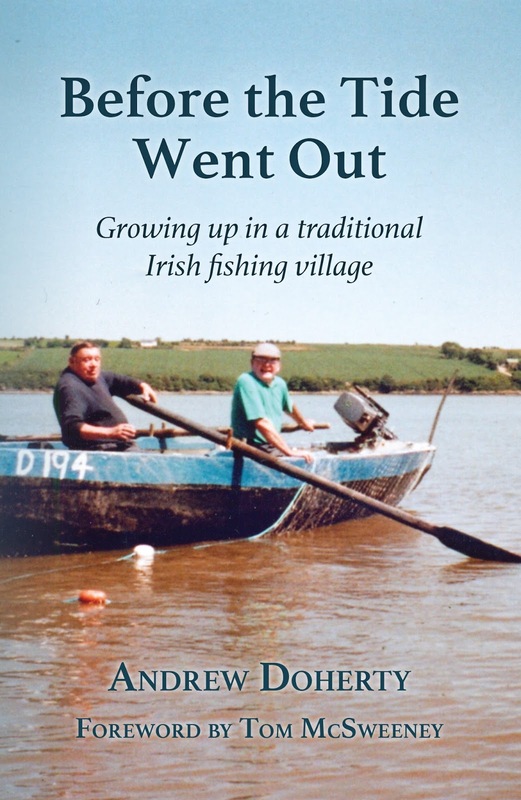 You can read David’s earlier account of growing up in the fishing village and the characters he met here. 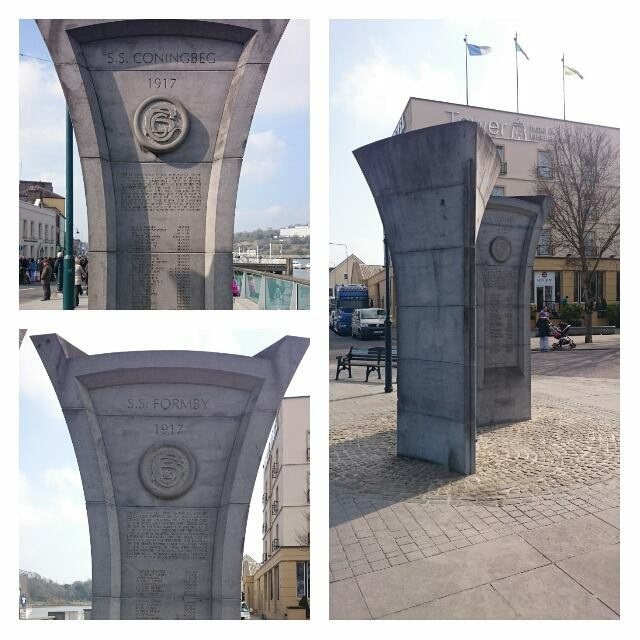 If you have a piece you would like to submit for consideration to the guest blog, all I ask is that it relates to Waterford harbour or our rivers, increases the knowledge and appreciation of our rich maritime heritage and is approximately 1200 words long. Please contact me via russianside@gmail.com or indeed if you know of someone who is interested in this topic can you let me know and I will happily follow them up. Schooner “St. Austell” dep. Dublin area April 1952 skipper Kevin Lawler for single-handed voyage to America. According to a press clipping I had, when he attempted to start the engine off Hook Head a starter cartridge blew out of the engine and set a barrel of oil afire. A stowaway then emerged from below decks. Both men abandoned and were picked up by the Dunmore East lifeboat. The wreck drifted onto rocks in Slade area and Bobby Shortall, a projectionist at the Coliseum in the days of Miss.Kerr, and possibly Tony O’Grady who later became a Chief Officer with Irish Shipping and Brian O’Connor and I decided to go and see it. We cycled to Passage East and crossed over on Patsy Barrons ferry, a half-deck fishing boat, to Ballyhack. I think it costed 4pence and if the ferry was on the other side of the river you hoisted a flag to call it. Then onto Slade area and after trudging across some fields we found the wreck. Burnt-out almost down to the waterline with the engine visible. I wonder if the engine is still there? On this years Late Late Toy show the television moment of the year was said to have been the unwrapping of Sergeant Graham Burke by his kids. He was, up to hours previously, serving with Irish peacekeepers in Mali, Africa. The host, Ryan Tubridy, became emotional at the scene, a family reunited. Yet when I heard of it my thoughts turned to my own childhood and how Christmas was marked by an absence; where seafaring men were as likely to eat their turkey dinner in a foreign port or in the middle of the Atlantic or Pacific. In my father and mothers generation absences at Christmas was just something to be accepted. Emigration was a fact of life and in a seafaring community that absence was probably felt much more as the men were part of a dangerous way of life, and where the monetary return was not very lucrative. Christmas in those days could be marked (if you were lucky) by a package from any part of the world with some hand made gifts and some trinkets with a card of greeting and a bit of news. I suppose that’s why those at home celebrated the holiday so much. In my own generation Christmas morning was as much about the house visits as anything else. One of only two days of the year that the pub closed, there was never as much drink consumed. And as it flowed so did the yarns. I recall one of a Christmas in New York and I think it was Charlie Duffin who was met off the ship by his relations and he was entertained all day and then dropped back to his ship the following morning. There were yarns of turkey flying across the table in an Atlantic storm. Of puddings going afire with too much brandy poured over it. Of the sights, sounds and smells of foreign ports and cities from as diverse as Buenos Aires, Cairo or Tokyo. Tom Sullivan of Coolbunnia told me recently that there was always a special effort made for Christmas on the ships he sailed on. No one was expected to work except on core duties. And there was always plenty to eat and drink with extras for all via the cook and stewards. But ships could also be docked in foreign ports and of course this created the best tall tales. Walter Whitty told me once of a session he went on in the Philippines. One of the crew was an ex WWII British Commando who described to an incredulous crew how they used to dispatch guard dogs during a commando raid, by wrenching the dogs front paws apart. According to Walter when his word was questioned the commando went out into the street and started chasing dogs around with a wild eyed frenzy. By the time the police had stopped him, several hounds lay dead in the street. When the ship sailed for Australia their crew mate was still in jail. My father had one of a spree in a Spanish port, although I’m not sure if it was Christmas or not. It started with a session in the harbour area, where you would not be sure of your life and you stuck close to your crew mates. Next morning he woke in a cell, and was dragged before the courts. “Will the prisoner state his name?” says the judge. “Bob Doherty your honour” says me father. Being away from family can never be easy however, especially at Christmas, and probably felt all the more when youngsters were involved. The following extract comes from the Irish Times of December 23rd 1955. “While people all over the world make arrangements to get home for Christmas by air, rail and sea, and worry about the time on Christmas Eve that they will arrive, they may be inclined to forget those whose job it is to get them to their destinations, and in particular the seamen. Few seamen ever count of a Christmas at home, for, as it often happens, they may get a few days with their families before Christmas and then on Christmas Eve they have to leave for Persia, South America or some place even further away. When the ESSO tanker Avonmouth leaves Dublin port this morning for the Persian Gulf she will have several Irishmen in her crew. 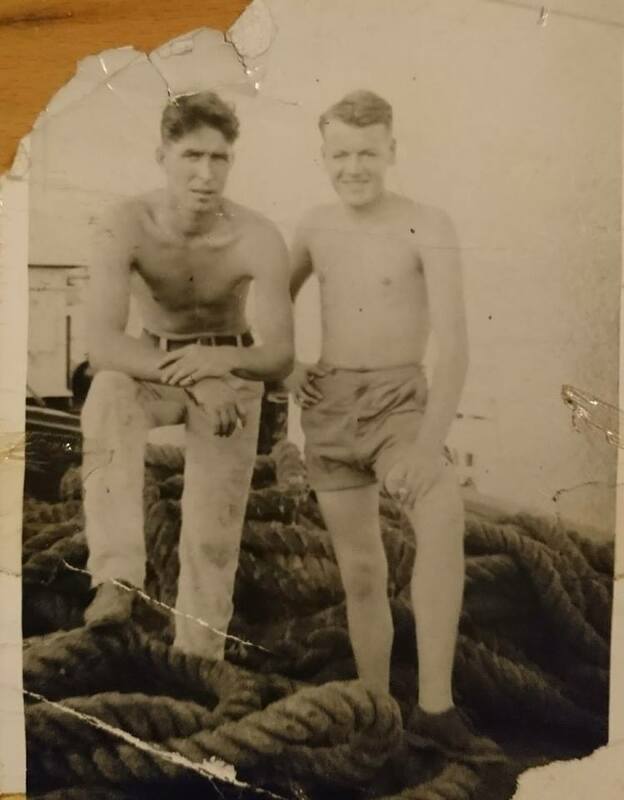 Two of these, who joined the ship for the first time yesterday, were Thomas Murphy, aged 20, of Victoria road, Clontarf, who has been at sea for three years, and Andrew Doherty of Cheekpoint, Co Waterford, who has been at sea for 27 years. Since going to sea, Mr. Murphy has not had a Christmas with his family, to whom he said goodbye once again yesterday. Mr. Doherty has not spent a Christmas with his family in seven years, and most of the other twenty he has spent in all parts of the world, mainly at sea. Looking through my fathers discharge book recently I discovered that he first went to sea at 19 years of age in May 1951. His first Christmas was aboard a US tanker the Missionary Ridge. He was at sea or in a foreign port for most Christmases over the next fifteen years. Some of the ships I had not heard of before such as the Andes of London, the Esso Glasgow or the MV Arklow. One of course which I wrote of before was the MV Ocean Coast, on which he was awarded a scroll for bravery following a Mersey river rescue. Another he served Christmas aboard was the MV Devon Coast, which Tom Sullivan had the following yarn about. My father and another chap were aboard over Christmas, all the other crew had gone to their homes. They were tasked with minding the ship but got fed up with their own company and went shoreside on a session. Staggering back to the ship they discovered a dog howling having fallen over the side of the quay by their ship which was stuck on a ledge. The howls were unmerciful and realising they would get no sleep, they grabbed a rope and my father straddled the gunwale and quayside while his mate slide down to grab the dog. Next moment my father gets a tap on the shoulder from the dock police asking what he thought he was up to. “Mercy Mission Mate” came the reply from Bob. Next day they were on the front cover of the Liverpool Echo, the dog in their arms and they both got a bonus from the company, as no mention was made of their “condition” in the article. My parents were married on Stephens Day 1964, one Christmas that he was home! I was born the following November and two weeks later he shipped out on the SS British Star not returning home until March. 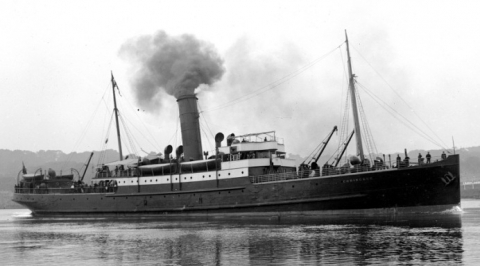 His last Christmas on a ship was aboard the MV Seriality for FT Everard and Sons of London. He signed on in New Ross on December 10th 1968 (my younger brother Roberts 2nd Birthday) and signed off the ship at Ellesmere Port (Liverpool) in January 1969. He went on to take a shore job with the paper mills in Kilmacow where he stayed until the lockout of 1978. MV Seriality alongside her sister ship. Accessed from http://www.shipsnostalgia.com 20/12/2017. So that Tubridy scene some weeks back touched a nerve on so many levels. Because behind all the drink, yarns and laughter at Christmas growing up, there was also a sadness. Young boys left home to join ships where they were thrown together with mixed crews of all nationalities and temperaments and told to get along. Pay was poor, conditions were relatively harsh (but improved considerably by my fathers era) and drink was the only means of escape. Men could be away for months and sometimes years and the longer that went on, the harder I think it became, to fit back in on their return. And needless to say it was the women who held everything together. Wasn’t it ever thus! Thanks to Tomás and Tom Sullivan for helping me with this piece. 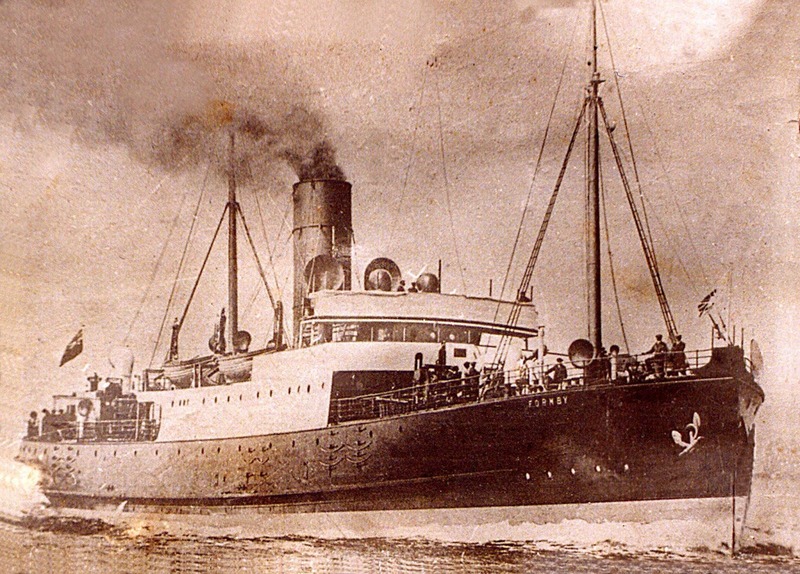 This weekend we commemorate the loss of the ships SS Formby and SS Coningbeg in December 1917. It’s a topic I covered last week with a view to promoting the commemoration this weekend. In thinking about the sailors who perished this week I came to realise that the last sight of the harbour the crew would have ever seen was the lighthouse at the end of the eastern tip of their home harbour. So today rather than the event itself, I thought I might blog about the sentinel that lights the harbour. One of my earliest childhood memories was listening to the long moaning sound of the fog horn that reverberated around the harbour and was clear to be heard on our perch on the hillside of Coolbunnia. As older children we were often out walking the roads at night and the light was a familiar feature sweeping the skyline, and in particular when it reflected off low lying cloud. As we did not have a car at home a visit down to the the Hook was out of the question, and I suppose my first proper sight of it, must have come when I first went drifting for herring in the winter of 1983. Is there any better way to see a lighthouse? David Carroll in a previous guest blog gave a lovely description of a 1960’s drive with his dad to the Hook from Dunmore. The Hook, has been a beacon for sailors and fishermen since the 5th C AD. St Dubhan, on founding a monastery at Churchtown saw a need for a warning light and a fire was lit on the tip of the headland. Some say that’s where the name Hook derives from; Dubhan being Irish for a fish hook. I’m old enough to remember the hue and cry nationally about the automation of the lights and the removal of men from the lighthouses, which finally happened at the Hook in 1996. Isn’t it incredible to think that for 1500 years the Hook was manned only for the tradition to stop due to an accountants abacus. In 2011, the fog horn was decommissioned, technology it was decided, can replace the human ear. In the last two years I noticed the latest change to this wonderful public institution. Someone, somewhere has decided that the strength of light from the hook is no longer required, and now when you walk the harbour the light is only visible from close by. No longer does it sweep the sky at Cheekpoint, and even from the Minaun its a stretch to witness it. If you don’t believe me travel to Dunmore East at dark, and look across the harbour. Next weekend in Waterford we will remember our greatest maritime tragedy when, within two days in December 1917, Clyde Shipping’s SS Formby and SS Coningbeg were sunk by a U Boat. Of the 83 souls who perished 67 were from the city, the harbour and hinterland. It commences on Friday 15th Dec with an official opening by the Mayor at City Hall followed by a series of talks and continues on Saturday 16th with a number of events including an ecumenical service in Christchurch and a wreath laying ceremony. Family, relatives, neighbours and friends gathered at the Clyde company offices for any scrap of news. Over Christmas the vigil continued but on Thursday 27th December the company felt obliged to write to each family confirming everyone’s worst fears, that they could no longer hold any hopes for their loved ones return. I wrote in detail about the incidents previously and I had a tremendous response from family members. A sample included Rose Egan who’s great granddad John Sullivan, a winchman on SS Coningbeg. After the trauma of the Sullivan family’s loss, John’s son William was killed in France three months later in March 1918. Neil White’s relative James Manning was lost aboard the SS Formby and he sent on a song he wrote about the incident. 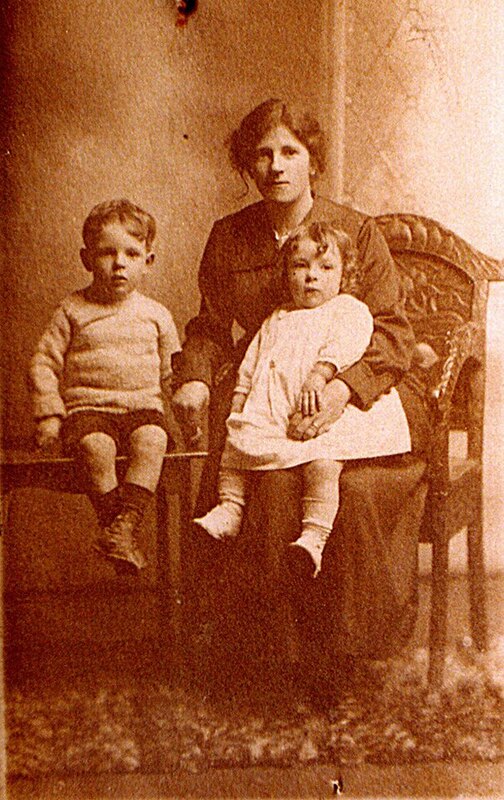 Shaun McGuire(1) sent on this information and photo (below) Thomas Coffey’s wife Mary (nee McGuire) and the two children she was left with when he was lost on the SS Formby. Mary died in 1950, her son Thomas in 1990 and her daughter also named Mary but known as May Walsh (nee Coffey) of Ballytruckle died in 2005. (1) Shaun regularly remembers Waterford’s War Dead on facebook. Following the Seahorse tragedy in Tramore bay in January 1816 an initiative was started to create a warning system about the dangers of confusing Tramore bay with the entrance to Waterford Harbour(1). 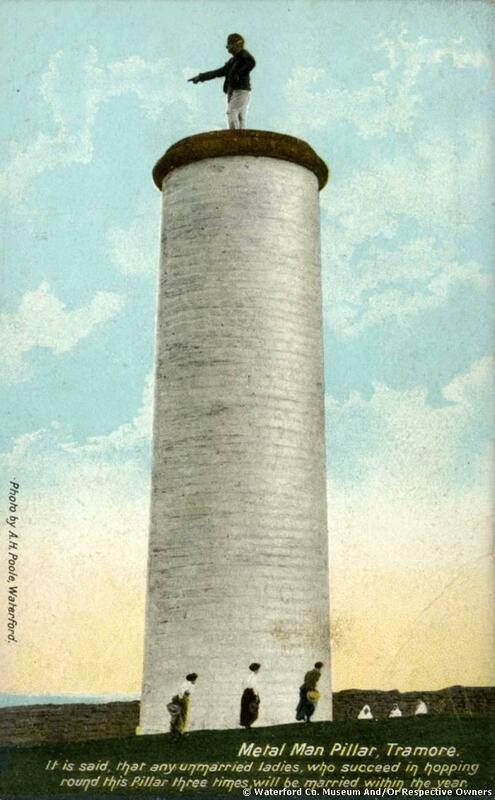 The system commenced with placing of three towers on the western entrance to Tramore at Great Newtown Head. Standing on the middle tower is what is known as the Metal Man, a Jack Tar who points away to sea towards the Hook, and who on wild nights was said to cry “Keep out, keep out, good ships from me, for I am the rock of misery.” On the eastern headland lie two towers, known as the Brownstown pillars. They have no dramatic figures, but I don’t think it diminishes them in anyway. And then further to the east marking the entrance to Waterford harbour lies the Hook tower, a lighthouse which as stood for hundreds of years and a very obvious beacon to seafarers. Although Hook as I said is ancient, the other towers were constructed by Lloyds of London, the maritime insurance company, and they were responsible for it for over a hundred years. (2) It was subsequently taken over by the Irish Lights, who I presume are still the owners. I remember as a child visiting the Metal man on a Sunday afternoon drive with my uncle, pat O’Leary. Pat and my aunt Margaret had five children and he drove a VW Beetle, so how he managed to fit others into the car I can’t even imagine now. But fit me he did, and probably my brother Robert too and we walked out and laughed as the girls hopped around the metal man – apparently a certainty for getting a husband. It was years later when I fished off the bay when I first heard of the count down system. It was the late winter early spring of 1984 and I was aboard the MV Reaper with Jim ‘dips’ Doherty and Denis Doherty gillnetting. Chats were always had as we worked on deck clearing fish out of the nets and cursing every time it came to clearing dog fish that had curled themselves into a súgan. One day they started to tell me about the towers and their purpose, claiming that it was all thanks to a fisherman from Cheekpoint. Apparently in the mid 18th C a hydrographic surveyor was aboard a Dunmore fishing boat known as the Nymph which was operating out of Passage East and with a harbour based crew. They were taking coastal markings and mapping fishing grounds. The Hydrographer was an English man named William Doyle, and he is credited with discovering the Nymph bank. 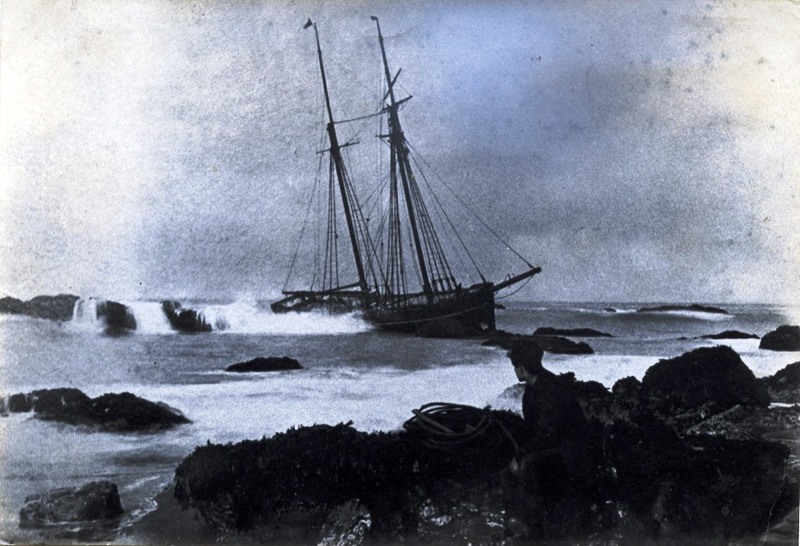 On one of the trips out the weather became dirty and Doyle indicated that they should return to shore. But the direction he pointed in was Tramore bay, and he was corrected on this and told that it was a sure fire way of being wrecked in dirty weather. 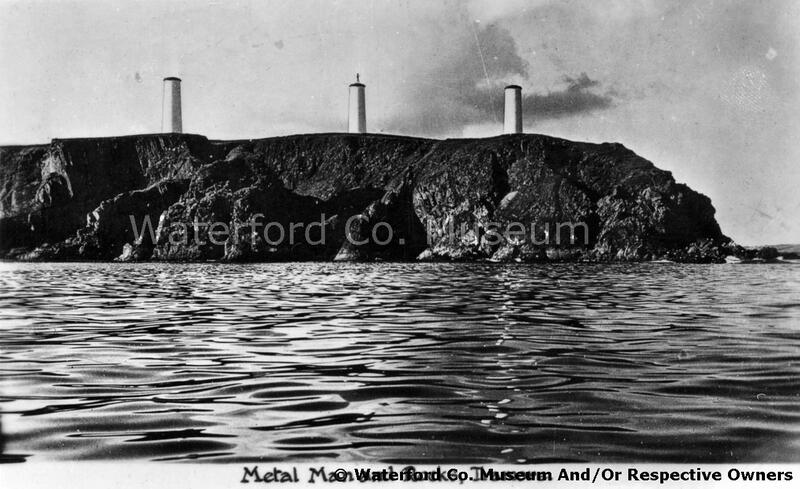 The crewmen had their own markings for getting back to Passage East and this, apparently, was what Doyle referred to as the Waterford Harbour Countdown system; a three, two one of headlands with a safe haven at the end. Now I’ve never read about the system, but according to my fishing companions that day when Lloyds came to mark headlands it was the written words of William Doyle that was used. If anyone could point me in the direction of same I would appreciate it. I will be attending the Christmas Fair at Bunmahon this Saturday 2nd Dec.